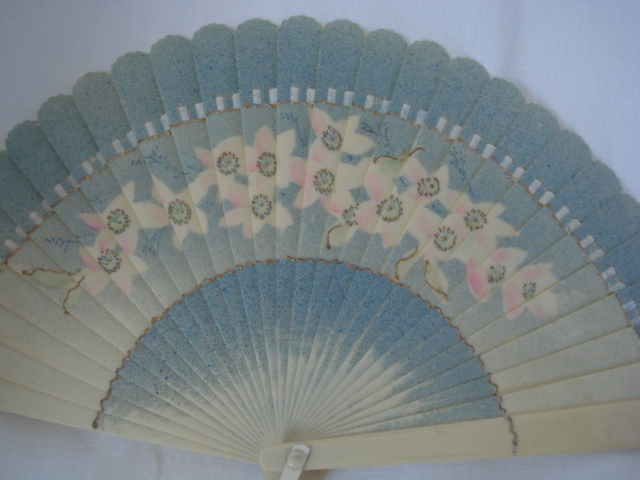 This is an extremely pretty brise type fan made of cream celluloid to imitate ivory. 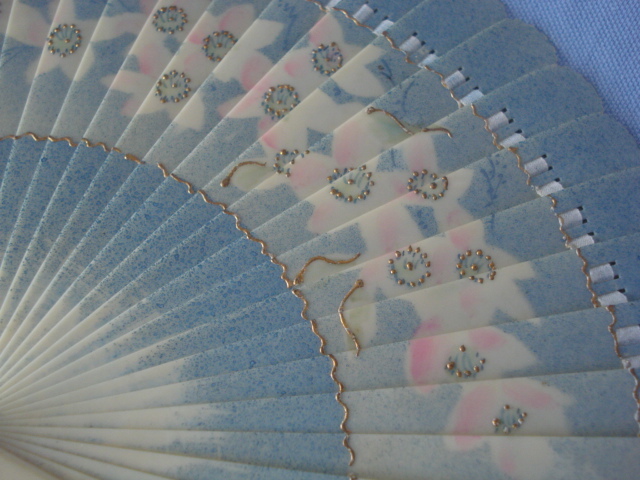 The vintage fan has a blue, pink and gold decoration on it which is sprayed silhouette work on its obverse. 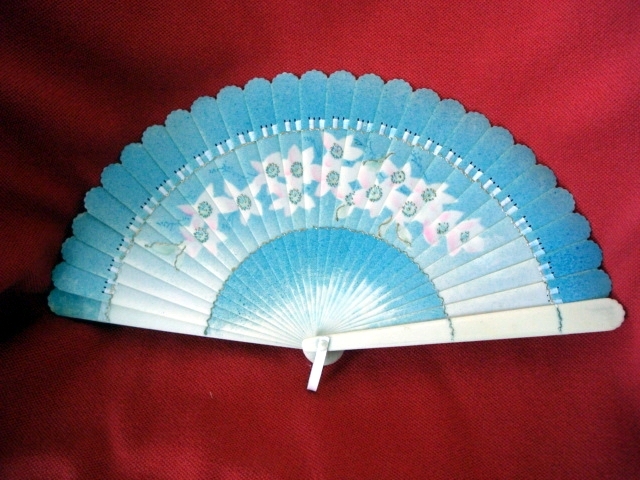 A plain cream coloured celluloid fan has had a random cut out design of flowers laid over it. The cut out flowers have then been gently sprayed with blue leaving their outlines. These floral shapes have then been 'blushed' with a touch of pink and gilded with neat little dots to make the flower middles. Lines of applied gold have also been used to give the flowers some stems and add more definition to the design. This pattern has been applied to one side only with the reverse of the fan being plain cream ivory in colour. 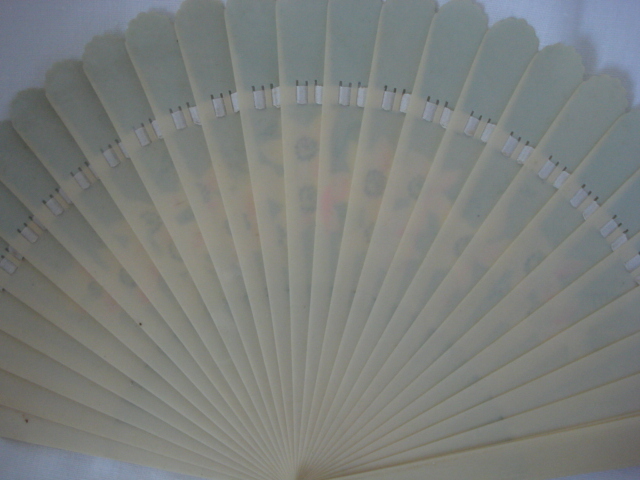 The guards and sticks of the fan have a crimped pattern to their tops and it is threaded through with an ivory coloured ribbon. The fan is in very good order with it's celluloid handle still present and its silk ribbon threading in good order. The only thing that should be mentioned is a slight curve to the tops of some of the sticks which is something that happens to celluloid fans but does not detract from its use for display or as a cooler! 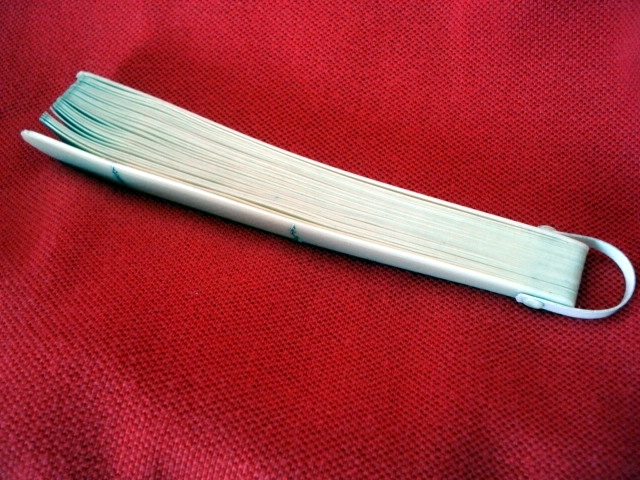 It is 16.5cms long and opens out to 31cms with a 3cm loop. Fans are a fascinating collectable and an important antique and vintage accessory. They have been used from very early times and by the most primitive peoples as cooling devices and for winnowing and activating fires. They have had a role in ceremony and are often objects of great beauty and elegance. There are some superb examples of fans in many of our museums and the role of the fan has evolved as a courtship device with a secret language and also as an advertising tool - particularly with the paper fans that were used for promoting champagne, night clubs and other things in the art deco 1930s period. I recommend the Shire Publication 'Fans' by Helene Alexander ISBN 0-7478-0402-B for further reading.